Paddle Duck in Where’s Carrie Cat? The idea came a few years ago when the iPad first came out. We wanted to create a full platform of Apps across many different areas of learning and development. I guess the realities of just launching one App hit and we had to revise our vision. “Where’s Carrie Cat?” was first released in September 2012. I have always loved the fact that children are encouraged to get up and dance and sing along to the PaddleDuck Song “The Duck Duck Waddle”. It’s important to us that children are encouraged to move their bodies and not just sit and interact with devices. What is your favourite page in the app? I like the rhyme and dance sequence and also discovering Vicky the Vegetarian Vulture hiding. Apart from fine motor skills we intended toddlers to gain listening skills and begin to form a connection between how they interact and what they see happen on the screen. Enjoying musical interaction is important for us as a team too. We say this is a great App for the very young. We hope it provides a gentle introduction to technology for developing brains. We purposely do not include all the ‘bells and whistles’ in our Apps as we feel that too much stimulation can be confusing for the youngest of children. Our Apps offer a calm alternative. We are actually concentrating on launching a Japanese version of the App at the moment. 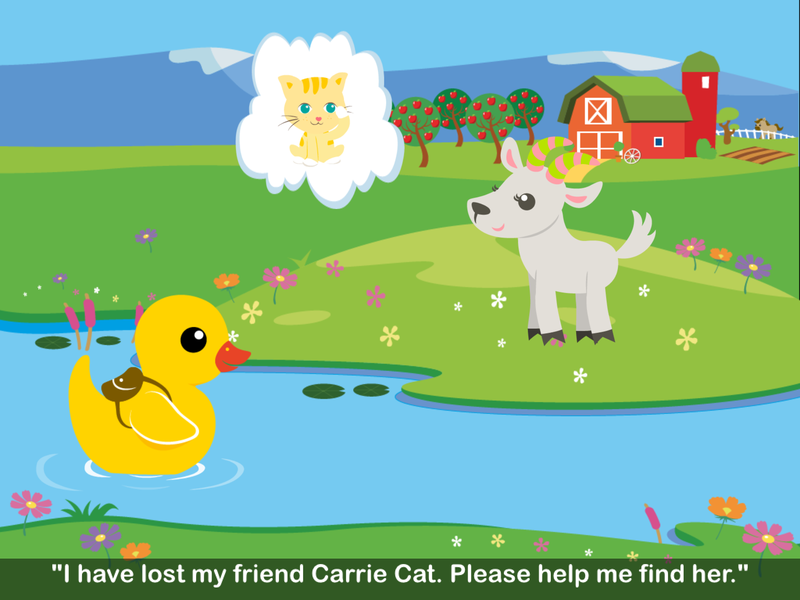 Meet Paddle Duck and join his adventure to find Carrie Cat on the Farm. An engaging, fun, and educationally interactive story for your toddler with rhyme, song and dance. Great reviews and ratings. As reviewed in Essentialbaby… “We liked that the app features lots of sound, colour and interactivity and it’s quite intuitive. 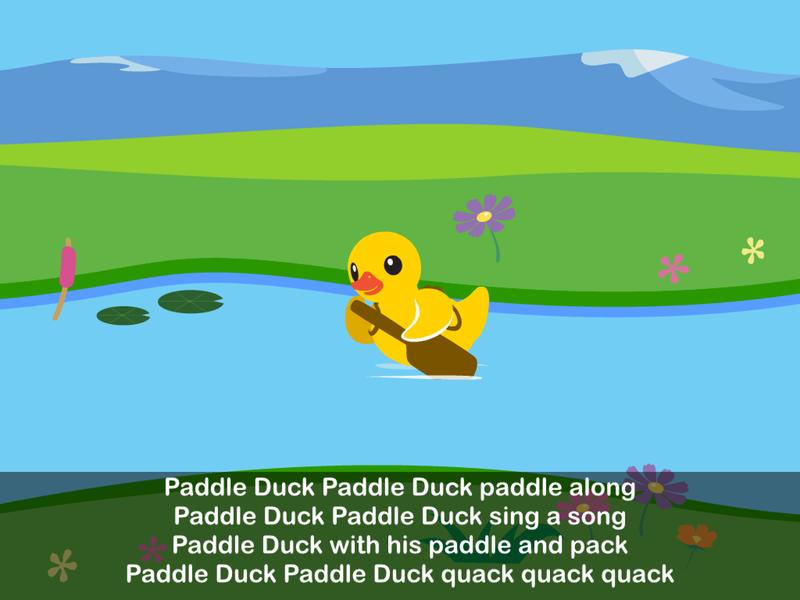 Our three-year-old tester liked counting along with Paddle Duck and making him swim”. The App is perfect for 18 month to 4 year olds and will delight your toddler as they have the opportunity to be part of the story and discover hidden surprises along the way. The App includes a rhyme to learn and recite, a dance to encourage toddlers to get up and move to and a fun song to learn and sing together. ***** The Carrie Cat app is a great introduction to the world of reading and adventure for small children. Opportunities to discover, predict and engage in song and dance are woven seamlessly into this App from PaddleDuck Learning. * Encourage discovery – “what might happen if you swipe the stars”? * Prediction – e.g. where might Carrie Cat be? What might be in this tree? PaddleDuck Learning Apps have a secure area for Parents to access Facebook sharing, sharing links and links to our website.